Last year, I decided we need to make more of an effort to eat healthier and more responsibly. Then, I fell off the wagon, because the frugal voice in my head spoke louder than the "eat healthy" voice in my head. I'm back on the responsible eating/organic bandwagon. 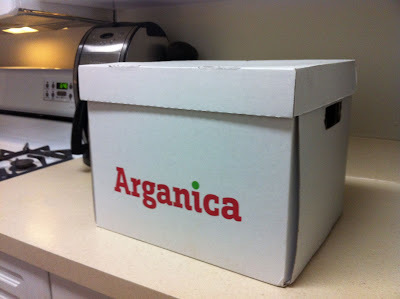 Last week, I ordered a crate from Arganica. Arganica is a farm club that brings local and organic produce and other items right to your doorstep. They serve the DC area, and other parts of Virginia, I think. If you don't live in Virginia, do a google search for local CSAs, and you might be able to find something similar in your area. You sign up for a membership ($20 a month) and then, as often as you want, you can order a crate to be delivered to your door. Depending on where you live, the delivery will either be on Thursday or Sunday. 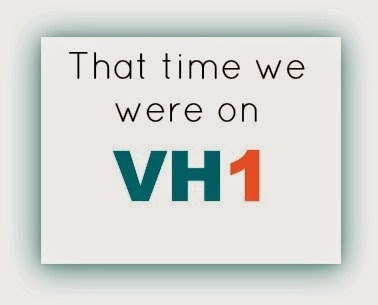 For us, it's Sunday mornings. It pretty much feels like Christmas morning when you open your door first thing on Sunday morning and see this on your doorstep. Note: When you order, you pay a deposit for the box, the liners that keep your items refrigerated, and if you order milk, the glass bottle. You simply put them back in the box and set it out the next Saturday night, and when they are returned, Arganica will credit the deposits back to your account. Last week was the first time I ordered milk. The milk is from Homestead Creamery. 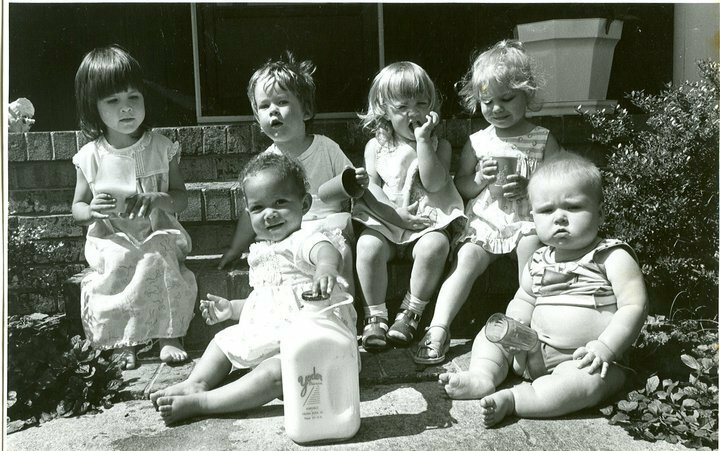 This is particularly exciting for me, because I used to live not that far from the creamery, and I remember my roommate's school kids (she was a teacher) going on a field trip there, and doing stories about the creamery at the local news station where I worked. 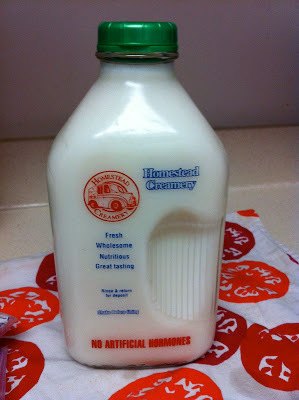 Who doesn't love milk in a glass bottle? I do! I also love it, because it takes me back to one of my favorite old family pictures of all time. That's me looking into my cup. And that is my "little" brother with the awesome belly and leg rolls. This is seriously my favorite picture of him EVER. It ALWAYS makes me laugh so hard! Anyway. Back on topic. Here's the contents of my crate last week. I ordered the "Local only" crate, which is $40.00, plus the milk, which was $3.99 for half a gallon. With my deposits, my order was about $50.00. Remember - this is ALL LOCAL, ALL ORGANIC. So, when you're comparing prices to your local supermarket, compare fairly! 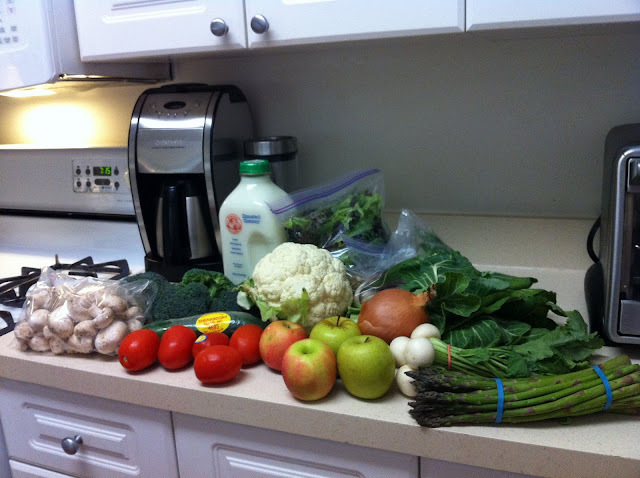 I got a bag of white mushrooms, a big bag of spring mix lettuce, roma tomatoes, cauliflower, asparagus, pink lady apples, broccoli, a cucumber, a bunch of collard greens, ramps (which I thought were green onions on steroids, ha!) a large yellow onion, and those white things (can anyone tell me what they are? radishes?) Plus, the milk. A week later, all that's left is the tomatoes (which I will make pico de gallo with today) some ramps, the cauliflower (which I will make cheesy mash with today), and the white things. There are some great things about getting a delivery like this each week. 1. It's just plain fun getting a boxed surprise on your doorstep! 2. It forces you to eat more veggies, so that they don't go bad. You comply, because you paid for it, and because you know it came straight from the farm, so you want to eat it, to honor the land and the farmers who worked hard to get you this food. 3. It forces you to learn how to cook new dishes. Because you would ordinarily never buy some things like ramps, or white things. 4. You feel satisfied knowing that you are eating organically, which frees your body from nasty pesticides, and also means you are being responsible and promoting farming that is healthier for the land and the people who work the land. So, as you can guess, I highly recommend it! I want to do a weekly post about my Arganica delivery, and the menu I build each week off of it. Let me know if that would be something you think is interesting, or if it's boring. Sometimes I feel like this blog is so random, and doesn't have ONE KEY focus. But, such is life, right? I mean, we all balance a lot of things. 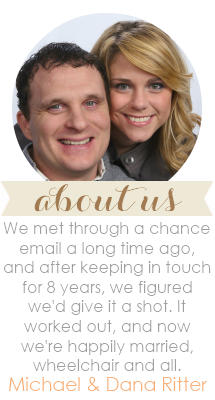 Sure, I'm a wife to a guy in a wheelchair. But, I'm also a Christian, a TV news producer, a dog lover, a home cook, and a person who is trying to eat organically. So, I guess you get to hear about all of that. Lucky you! Haha.